Recollecting Nemasket: "Paddies and No More"
In the late 18th century, Lord Edward FitzGerald, a leader of the United Irishmen movement referred to himself as "a paddy and no more". In so doing he took for himself what was then a pejorative term, and imbued it with a sense of both definitiveness and dignity. Much the same can be said of later "paddies", those Irish Catholic men who settled in Middleborough during the mid-19th century whose hard work and fortitude in the face of discrimination helped establish the Irish-American community locally. Like Irish-born women, Irish-born men in Middleborough in the mid-19th century were initially largely confined to a single occupation, that of laborer. In 1850, 79.2 per cent of Irish-born men of working age (age 16 and older) resident in Middleborough were employed as laborers. The term "laborer" however is somewhat misleading as it included not only common or manual laborers, but also agricultural, industrial and railroad laborers. In regard to the broadness of the term, Boston immigrant historian Oscar Handlin remarked that these "unskilled, insecure day laborers ... informed the census takers that they were just laborers - a classification descriptive not of their function, but of their lack of function." In 1850, at least one-third of Middleborough's Irish laborers were residing with master farmers by whom they, presumably, were employed. The remaining two-thirds were probably common rather than industrial or railroad laborers as the factory system for textiles (which would employ more Irish in town during the period than any other industry) had not been fully established and the railroad never employed more than a handful of Irish laborers locally in the period 1850-80. The large size of mid-19th century Middleborough farms generally necessitated the hiring of farm labor, particularly during peak seasons such as haying in late June and early July. Newly arrived Irish immigrants, many from rural backgrounds, themselves, were able to well fill this need. The percentage of Irish-born Middleborough laborers declined to 64.5 per cent in 1855 and further to 55.6 per cent in 1860. This drop was countered by a subsequent post-bellum rise, with the figure for 1865 standing at 70 per cent, much higher than its pre-Civil War level. It was not until 1880 when it dropped again to 64.9 per cent that it returned to a level comparable to 1855. The number of common and agricultural laborers of Irish birth declined steadily throughout the period 1850-80 as Irish men acquired the skills and money which enabled them to move into less menial occupations. Like Irish women, Irish men were subjected to the worst stereotypes. 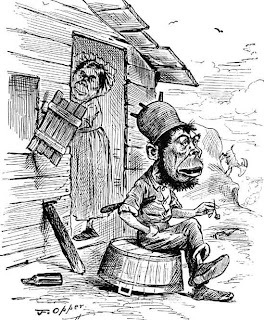 Considered fractious, volatile, shiftless, unintelligent, and with a propensity towards drunkenness, the male Irish immigrant was derisively referred to throughout the period as "Paddy". Certain racist representations in the popular press even characterized them as subhuman. The standing of the Famine Irish however received an unexpected boost from the Civil War when many Irish men, though having been in the country for only a short time, readily volunteered in the Union army. Most notable among Middleborough's Irish-born soldiers was Peter Fagen, a tailor. Enlisted and mustered August 14, 1862, Fagen was discharged for disability in February, 1863, at Alexandria, Virginia. Despite this disability, he re-enlisted the following year, served in Virginia and was wounded May 12, 1864, at Spotsylvania. He was then transferred to the Veteran Reserve Corps, January 1, 1865, and discharged once more for his disability, June 23, 1865. It is likely that during the war Fagen lost one of his eyes. Some Famine Irish were so eager to serve that like many American boys they misrepresented their age to military authorities. John Grady, a student who resided with the family of John Scanlon, was aged 15 in 1860 according to the Federal census of that year. Yet when he enlisted on November 22, 1861, his age is given as 18 and his occupation as farmer. In 1865, following the war, Grady was listed as a soldier and his correct (younger) age given. The growth of Middleborough's woolen industry following the first years of the Civil War led to the employment of Irish laborers which explains the increase in the number of laborers during that period. Whereas in 1850, 1855 and 1860 there was no significant Irish-born industrial labor force of which to speak (in 1860 only 1 of every 20 Irish-born men in Middleborough was employed in a mill), the post-bellum period witnessed a great influx of Irish into local industry. By 1865, 35.7 per cent of Middleborough's Irish laborers found employment in a mill while the figure for 1880 was even higher at 38.2 per cent. While Irish industrial labor in Middleborough was primarily concentrated in the textile industry (briefly in cotton, then woolen manufacturing), Irish laborers also found employment in the local shovel works at Muttock and the Upper Factory at Wareham Street, in the Bay State Straw Works on Courtland Street, and in the Clifford Street needle manufactory. The appeal of industrial work to Irish men was great. In contrast to manual and agricultural labor which typically precluded any form of occupational advancement or job security (often being seasonal), industrial labor offered Irish men (and later women) not only a more secure form of employment and an opportunity to acquire new skills, but the incentive of promotion through hard work. By 1860 there were already two Irish-born overseers in Middleborough's cotton mill, the youngest of whom was John Whalen, aged 29. Irish-born men in Middleborough experienced greater occupational diversity than did their female counterparts. While many Irish immigrants were relatively poor and uneducated and tended to find themselves employed as laborers, those with skills or financial means frequently succeeded in other areas, particularly shoe-making and agriculture. Ralph McSorley, George E. Gibbs, William Shea, John Sullivan, John Shields, John Morrison and John Lynch were all Irish-born shoemakers active in the trade in Middleborough prior to the Civil War. Relative to agriculture, Patrick Quirk of South Middleborough appears to have been the first Irish Catholic farmer (as opposed to agricultural laborer) in Middleborough in the mid-1840s. Quirk was followed by Timothy Murphy, Patrick Meade and James Foley in the 1850s, Thomas O'Donnell in the 1860s, and Neal Doherty, William Robinson, Bernard Carroll and Michael Dacey in the 1870s. Because of poor soils, however, farming never proved a very lucrative proposition in certain sections of town which probably explains why many of these Irishmen engaged in farming for only a few years, with Quirk turning to soap making and Murphy choosing to work as a shovel-maker. Still other Irish immigrants turned to new occupations in the later 1800s including blacksmithing (Michael O'Connell, Timothy Harrington), teaming (Jeremiah Lynch, Patrick McDonald), iron-working (Michael Gorman), tailoring (Peter Fagan, John McGuire, Michael F. O'Toole) and baking (Peter J. Curley). Boys like Edmund Tobin and later Peter Harrington who were employed at the age of sixteen as a wheelwright and a cooper respectively, were in all liklihood apprentices, one of the few ways in which Irishmen could learn a trade and thus avoid a lifetime of day laboring. In time, Middleborough's Famine Irish immigrants would even begin to move into the professions. By 1880, a few Famine Irish in Middleborough had begun to enter the professional and business class, namely Edward Connelly, a hotel keeper; David O'Keefe, a saloon keeper; and most notably John Clark Sullivan, an attorney. Their success would demonstrate the possibilities eventually open to local Irish immigrants. 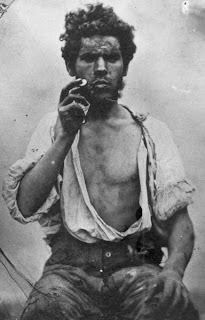 The stereotype of the Irish immigrant male in the mid-19th century was that of an ignorant and violent man (note the shillelagh tucked under his right arm). Frequently complacent in the face of most of what was going on about him, his quick temper was easily roused by drink or the prospect of a fight. In reality, these Irish-born men were forced to overcome both this blatant stereotyping and the even worse racism which followed in the wake of their arrival. Irish Laborer, ambrotype, c. 1850. Coláiste na hOllscoile Corcaigh/University College Cork. This rare photograph depicting an Irish laborer in working clothes represents a more truthful image of the mid-19th century Irish. Most local Irishmen of the mid-19th century were engaged primarily as common and agricultural laborers. Through dint of hard work, Middleborough's first generation of Irish Catholic men were able to establish a stable life in America and lay the foundation for more successful lives for their children and grandchildren. Oscar Handlin. Boston's Immigrants, 1790-1865: A Study in Acculturation. 1941.